A 45-year old lady presented with fatigue, polymyalgia, proximal muscle weakness, jaw pain, and dysphagia of 6-month duration. The creatine phosphokinase (CPK) levels were mildly elevated [407 u/l]. Her nerve conduction study and electromyography (EMG) were normal. Magnetic resonance imaging (MRI) of the muscles showed hyperintensities in the gluteal muscles (bilateral gluteus maximal and gluteus medius muscles) as well as the tibialis posterior and soleus muscles. During the next 3 days, her weakness increased, she became bed bound, and developed severe neck and back pain. She was prescribed sertraline for anxiety 6 months ago. Her initial dose was 100 mg, which was increased up to 150 mg, 3 weeks earlier. She was not on any other medications. On examination, she had trismus [Figure 1], muscle tenderness over the masseter, paraspinal and calf muscles, nasal twang, and grade 3/5 power in her proximal upper and lower limbs with normal tendon reflexes. 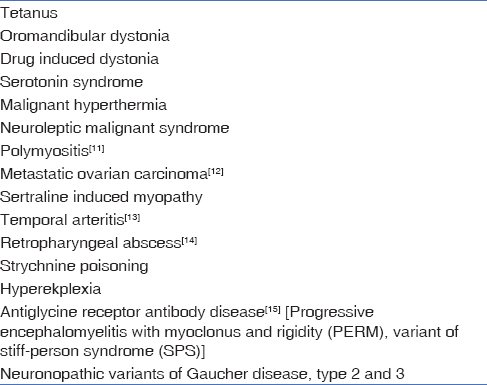 The myositis antibody profile was normal. A repeat muscle MRI showed diffuse symmetrical muscle edema in both lower limbs, as well as masseter and pterygoid muscles [Figure 2]. Whole body positron emission tomography-computed tomography (PET-CT) showed diffuse symmetrical muscle hypermetabolism in leg muscles as well as thoracic and cervical paraspinal, masseter, and pterygoid muscles [Figure 3]. The muscle biopsy of the left tibialis anterior showed nonspecific changes. At this point, a drug-induced myopathy was considered and sertraline was discontinued. Her symptoms started improving within 3 days. By 4 months, she was asymptomatic. A repeat PET-CT showed almost complete resolution of muscle changes. Our patient had a rapidly progressive painful myopathy with trismus and severe neck/back pain [Table 1].,,,, The PET-CT scan showed reversible changes in many muscles including the paraspinal and masticatory muscles on drug discontinuation. Selective serotonin reuptake inhibitors (SSRIs) are associated with rhabdomyolysis. Sertraline is a known offender with at least 5 cases reported in literature.,,,, Most cases occurred within 4 months of drug initiation and after a dose increase or after a strenuous exercise. Although most patients have been on polypharmacy, there is one case report where the patient was on isolated sertraline medication. Sertraline is associated with mitochondrial dysfunction and hepatotoxicity., SSRIs inhibit a voltage-dependent anion channel in the pore of the mitochondrial inner membrane permeability transition (MPT), causing MPT induction and mitochondrial swelling. Sertraline also uncouples mitochondrial respiratory complexes I and V with adenosine triphosphate (ATP) depletion and energy failure. Moreover, sertraline induces the mitogen-activated protein kinase (MAPK) signaling pathway, activating both intrinsic and extrinsic caspase-dependent apoptotic pathways. The Naranjo probability scale score in this patient was 9, confirming a definite drug adverse reaction. In conclusion, SSRIs should be kept in mind as an etiological factor in the presence of painful myopathy. Snyder M, Kish T. Sertraline-induced rhabdomyolysis: A case report and literature review. Am J Ther 2016;23:e561-5. Gareri P, Segura-García C, De Fazio P, De Fazio S, De Sarro G. Sertraline-induced rhabdomyolysis in an elderly patient with dementia and comorbidities. Ann Pharmacother 2009;43:1354-9. Watson WA, Litovitz TL, Rodgers GC Jr, Klein-Schwartz W, Reid N, Youniss J, et al. 2004 Annual report of the American Association of Poison Control Center's Toxic Exposure Surveillance System. Am J Emerg Med 2005;23:589. Bates DE, Baylis BW. Rhabdomyolysis and hepatotoxicity in a female body builder. J Trauma 2006;60:407-9. Akin S, Aribogan A, Brown DR. Rhabdomyolysis in sertraline intoxication: A case report. Am J Case Rep 2008;9:23-6. Labotz M, Wolff TK, Nakasone KT, Kimura IF, Hetzler RK, Nichols AW. Selective serotonin reuptake inhibitors and rhabdomyolysis after eccentric exercise. Med Sci Sports Exerc 2006;38:1539-42. Li Y, Couch L, Higuchi M, Fang JL, Guo L. Mitochondrial dysfunction induced by sertraline, an antidepressant agent. Toxicol Sci 2012;127:582-91. Collados V, Hallal H, Andrade RJ. Sertraline hepatotoxicity: Report of a case and review of the literature. Dig Dis Sci 2010;55:1806-7. Chen S, Xuan J, Wan L, Lin H, Couch L, Mei N, et al. Sertraline, an antidepressant, induces apoptosis in hepatic cells through the mitogen-activated protein kinase pathway. Toxicol Sci 2014;137:404-15. Naranjo CA, Busto U, Sellers EM, Domecq C, Greenblatt DJ. A method for estimating the probability of adverse drug reactions. Clin Pharmacol Ther 1981;30:239-45. Singer PA, Chikarmane A, Festoff BW, Ziegler DK. Trismus. An unusual sign in polymyositis. Arch Neurol 1985;42:1116-8. Benjamin R, Zhai J, Morgan R, Prakash N. Trismus and diffuse polymyalgia: An unusual presentation of recurrent metastatic ovarian cancer. BMJ Case Rep 2014;16;2014. Nir-Paz R, Gross A, Chajek-Shaul T. Reduction of jaw opening (trismus) in giant cell arteritis. Ann Rheum Dis 2002;61:832-3. Harkani A, Hassani R, Ziad T, Aderdour L, Nouri H, Rochdi Y, et al. Retropharyngeal abscess in adults: Five case reports and review of the literature. Scientific World Journal 2011;11:1623-9. Iizuka T, Tominaga N, Kaneko J. Clinical spectrum of anti-glycine receptor antibody-associated disease. Rinsho Shinkeigaku 2013;53:1063-6.